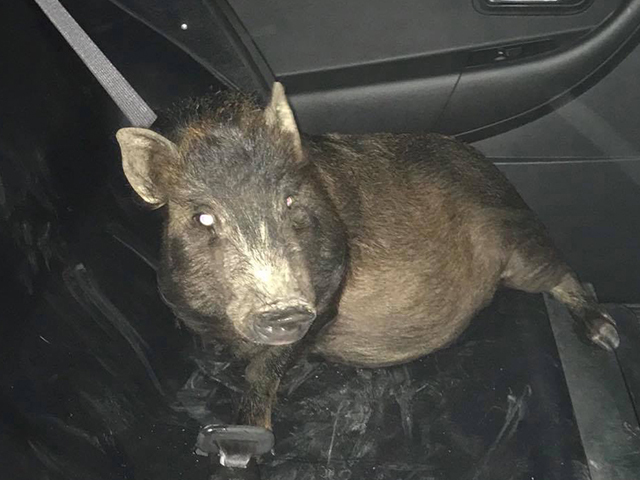 Quote: Officers in North Ridgeville, Ohio, received a call from a man who said while walking home from a train station, a pig started following him, and he didn't know what to do. Thinking he had just left the bar in Elyria named the Train Station, police went out to pick up the caller, who they believed was drunk. When officers arrived, they found the man stone-cold sober, complete with his four-legged stalker in tow. In the end, the pig was very cooperative and was placed in the back of a police cruiser and taken to the station. The pig was reunited with it's owner, so happy ending. They are very bright animals, the guy must have smelled like leafy green vegetables. (05-21-2018, 03:45 PM)Meh Wrote: They are very bright animals, the guy must have smelled like leafy green vegetables. The guy seemed like a boar? Wild boar... there's an oxymoron. He should count himself lucky to have anything at all follow him . for myself , if not for flies , nothing would follow me . Well that little piggy is pretty cute. He could follow me home anytime! He's a potbelly they are great, as long as you don't feed them too much. They will get huge if you don't watch it. (05-21-2018, 08:32 PM)Octo Wrote: Well that little piggy is pretty cute. He could follow me home anytime! "cute" that has completely alluded me. But prolly has no k9 incisors. I agree pork is off the menu for me. I hate the way it sticks between your teeth, the texture and the taste. Only with bacon did they get it right. Pork chops are awful about hanging around in the teeth too, but bacon is wort it. A real stick to your teeth meal. I guess it depends on the way your teeth are.